The marchers left Eumungerie at 7 am this morning. They stopped for morning tea at a property on the Coolbaggie Forest Road, which was very kindly provided by two local farming families. The marchers enjoyed immensely scones with jam and cream, sponge cake, and watermelon, and sat around on hay bales, which made welcome soft seats. The marchers stopped at Mogriguy for a lunch break, before continuing on into the Goonoo National Park. They covered a total of 33 km to where they finished the day’s route at about 5 pm. 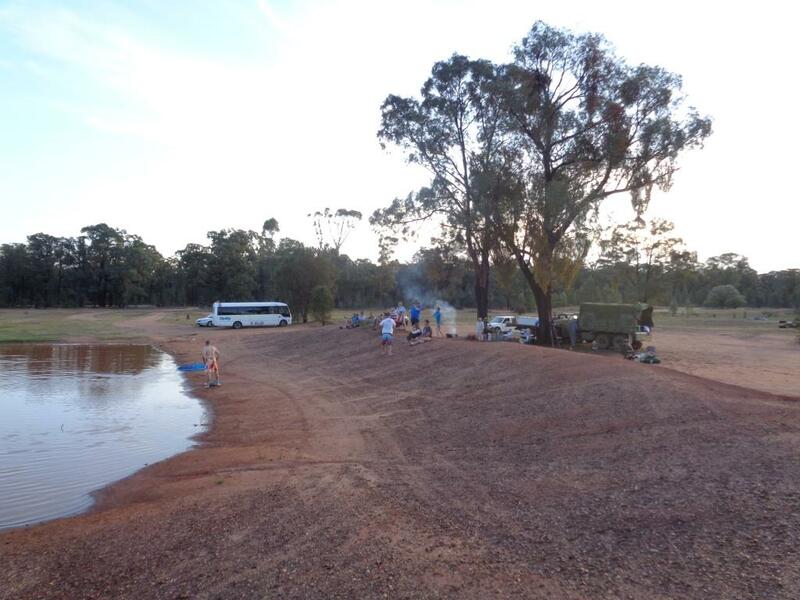 They then set up camp in the spacious green camp area at Riley’s Dam, where a number of them cooled their tired feet in the dam. This entry was posted in Uncategorized and tagged Goonoo National Park, Mogriguy. Bookmark the permalink. Thanks so much for posting these fascinating accounts and photos of the 2015 Cooee March! It is wonderful to follow the marchers’ progress on this epic re-enactment. Much appreciated! It is so good to hear how they are going! Thank you for this great blog. Following this march all the way, keep up the posts. Cheers to the marchers! It is so good to hear how the marchers are going! Thank you for this great blog. Great effort on the part of all the marchers. I recognise those flowery swimmers Jeff Rookyard! Keep up the good work.